Born in 1973 in Romania. 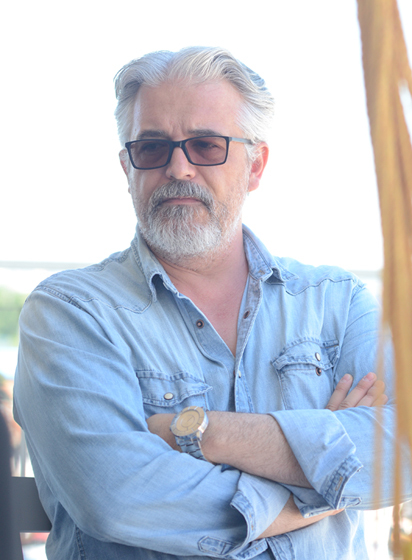 Before deciding to embark on film-making, Constantin Popescu graduated in Spanish and English from the University of Bucharest, and worked as a translator, and production and assistant director. Constantin started a series of short films in 2004, with The Apartment (Apartamentul), which was followed by A Lineman’s Cabin (Canton) in 2005, Water (Apa) in 2006 and The Yellow Smiley Face (Fata galbena care rade) in 2008. He also directed the ‘Pig’ segment in the wry portmanteau film Tales From The Golden Age (Amintiri din Epoca de Aur). His debut feature length film was premiered in 2009, The Portrait Of The Fighter As A Young Man (Portretul luptatorului la tinerete). Principles of Life (Principii de viata), Constantin’s second feature film,was premiered in 2010 at the San Sebastian Film Festival (Spain). His third feature POROROCA won Best Actor for Bogdan Dumitrache at San Sebastian in 2017.